This is my second day in Nome waiting for more racers to arrive. The next 3 riders are Nome local Phil Hofstetter and Jay Cable and Kevin Breitenbach from Fairbanks. They have left Elim this morning and are on their way to Golovin. Troy Szcurkowski from Australia is crossing the sea ice between Shaktoolik and Koyuk. Co race director Kyle Durand, Toni Lund from Finland, Craig Bullen, Adam Erritzoe from Denmark are on their way to Shaktoolik. Beat gave this report from the Kaltag portage today. 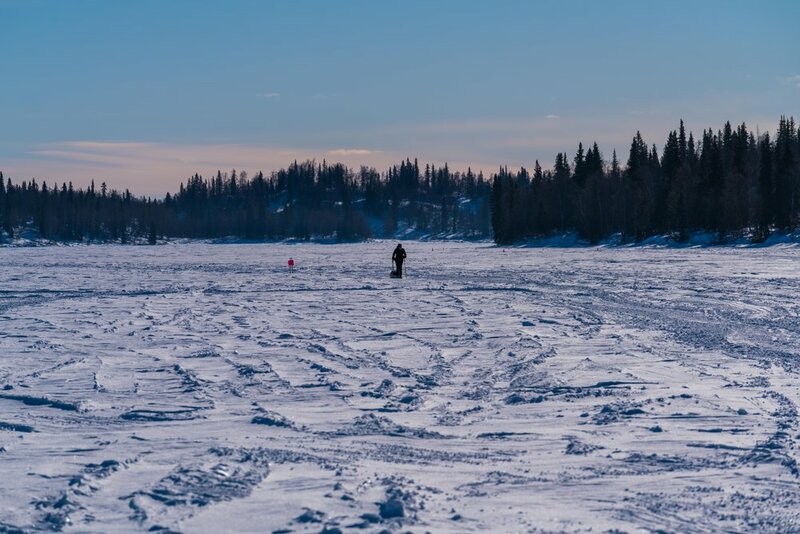 "The Thursday morning report from Beat Jegerlehner: He had a good rest in Kaltag and is now on the move over the portage, leaving the Yukon River to traverse a wide pass to the coast at Unalakleet. Trail conditions are still drifted and soft, but he's been moving well after good sleep in the Kaltag School, his first indoor space in three days. Peter is back on a mission, flying down the trail this morning. Beat knows he still has a long way to go, and is content to continue his well-practiced methods of travel. The photo is one of Beat's, blowing snow on the Kaltag Portage in 2013. Jay Petervary rolled in under the burled arch among the top ten Iditarod mushers under sunny calm day in Nome today at 2:45 PM. He holds a new Southern Route record with 16 days 23 hours and 45 minutes! Congratulations Jay. This is his 4th finish in Nome and third win. The next cyclist are Nome local Phil Hofstetter (a previous winner) and Fairbanks riders Jay Cable ( a previous winner) and Kevin Breitenbach. They are in Koyuk and two days behind Jay. This might be the biggest lead a racer in the ITI has had over the next rider in the 1000 mile distance! 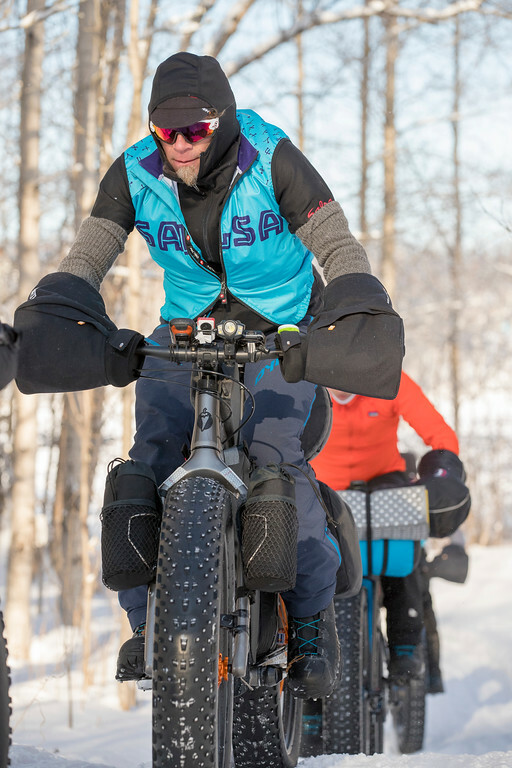 There was a crowd of mushers, Iditarod fans, Kathi Merchant, co race director, Bjorn Olson and Kim McNett, well known Alaskan fat bike expeditions bikers had flown in to ride to Fairbanks from Nome. greeting as Jay rolled in with a big smile and great trail stories of endurance and perseverence with hundreds of miles of soft trail conditions. Well done Jay. Beers and pizza, shower and a bed in Nome are well deserved! Jay is out of White Mountain on the final 77 mile stretch to Nome. I am flying out in the morning. I hope I can beat him to the finish line unter the burled arch in Nome! Phil Hofstetter is reporting strong winds on the flats near Shaktoolik. It was blowing 30 mph, with lots of snow to drift and trails to drift in. Kevin and Jay C are also held up there. They plan to depart Shaktoolik tonight when winds are supposed to die down. Troy S. was making 9.5 mph on the portage trail with Kyle, Adam Toni and Craig B in tow. Trails must be good for them for now! 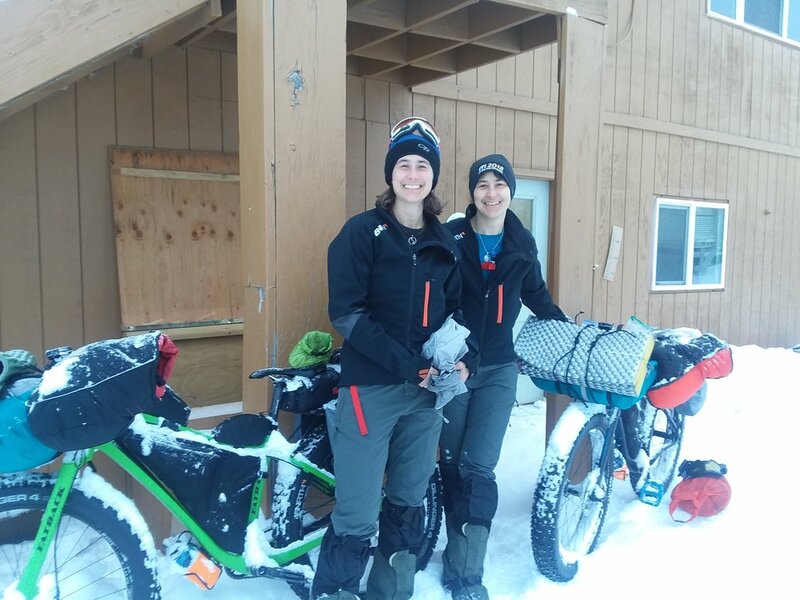 Jay;s bike outside a shelter cabin on the Iditarod Trail this week. A 50 percent chance of snow, mainly after 10am. Cloudy, with a high near 25. Northeast wind around 10 mph. Snow likely. Areas of freezing fog. Cloudy, with a low around 12. Southwest wind 5 to 10 mph. Chance of precipitation is 70%. New snow accumulation of less than one inch possible. A 50 percent chance of snow, mainly before 1pm. Mostly cloudy, with a high near 18. Southwest wind 10 to 15 mph. 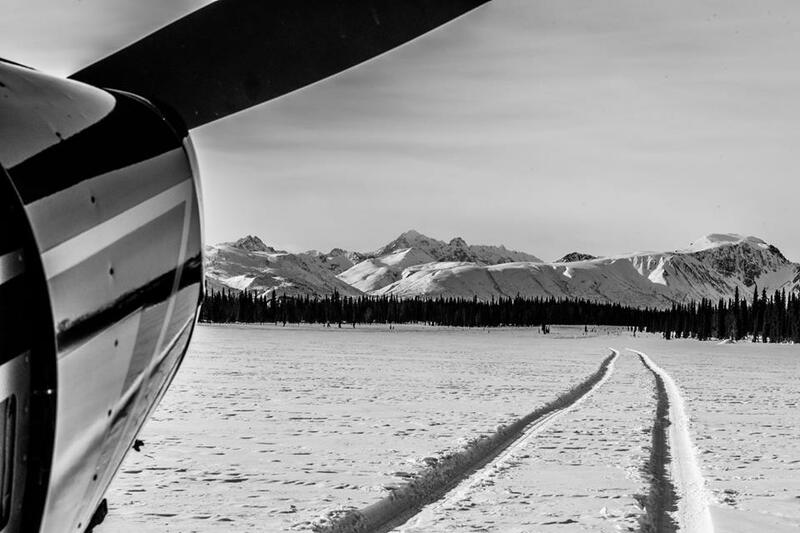 Race leader Jay Petervary is on his way to Golovin coming off LIttle McKinley which can be a very windy spot on the trail.The three Alaskans traveling together Kevin, Jay C and Phil are departing Shaktoolik after spending the night there and are getting ready to cross the sea ice to Koyuk. The next 5 cyclist, Kyle, Adam who was having rear hub issues, Craig, Toni and Troy are currently still in Kaltag. So I made it to Kaltag this morning. After probably the best ride of my life. 75 miles up the Yukon River. The first 15 miles were really slow I could not get going! The previous day I was on the move for 21 hours and motivated to take advantage of rare good conditions and made 87 miles of good progress. Exhausted and drenched in sweat I did not sleep warm. Even though my bag is rated for -48. I stopped at the Iditarod dog race check point for a while, chatted to the racers, took pictures and had some coffee. It was 6 pm when I got back on my bike and I was starting to feel quite good. After a while I started to really push and the ambition to reach Kaltag in one shot was beginning to form. I decided to push to within 30 miles before I would stop to make myself a hot drink and snack, I melted more snow for hot drinks later on. It was -15 and I was sweating hard and feeling stronger still, I should not be feeling this way after 8 hours of riding a 75lb fat bike. The feeling of just being able to push harder and harder was exhilarating , it was awesome. I attacked the trail like it was a time trial for the last 25 miles. I blew past the other racers as they were asleep in their bags on the snow. It was 4 am and there were no more tire tracks in front of me. Tearing down the wide Yukon in the dark, my headlamp not powerful enough to reach the banks either side of me. The surroundings were surreal and I was euphoric, this was amazing. At Six am I ride up off the river and into the ramshackle streets of Kaltag. In the check point I sat and breathed hard for about 20 mins. I went up stairs to see the on shift vets ready to check in the Next Dog team. I insisted that one of the bewildered Vets give me a high 5 before I pounded down a big handful of cookies they offered me. Best ride of my life. Race leader in the 1000 mile event Jay Petervary has left Koyuk this morning and is moving along at 5.5 mph. Cloudy with a chance of snow. Areas of freezing fog in the afternoon. Highs in the upper teens to mid 20s. Northeast winds to 10 mph. Mostly cloudy. A chance of snow in the evening, then a slight chance of snow after midnight. Lows 9 to 12 above. North winds to 10 mph. Kevin and Jay C have made it into Unalakleet. From Jay Cable's face book page "Unalakleet! The highlight of yesterday's ride was getting a fist bump from Hugh Neff while on the trail, then hanging out with him and listening to his stories for a bit at old woman cabin." from Kevin:"Back in unalakeet a year and one day since last time. Think Jay and I might just go for a bike ride today!" Kyle and Adam report blizzard conditions getting into Kaltag. Peter and Beat are on route to Eagle Island. Klaus is out of Iditarod. 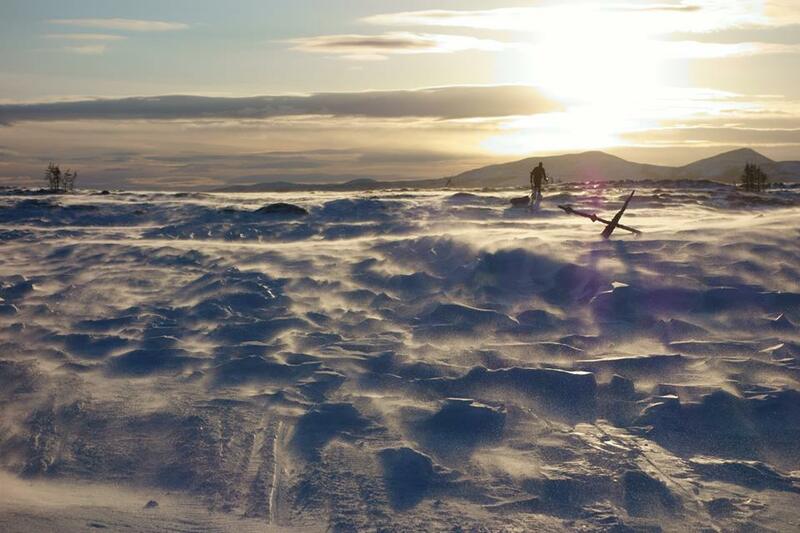 14 days into the race race leader Jay Petervary is 770 miles into the race, crossing the sea ice today. Mostly cloudy, with a high near 14. Calm wind. A 10 percent chance of snow after 5am. Mostly cloudy, with a low around 6. North wind around 5 mph. Snow, mainly after 2pm. Areas of freezing fog after 2pm. High near 22. North wind around 10 mph. Chance of precipitation is 80%. New snow accumulation of around an inch possible. Snow, mainly before 11pm. Areas of freezing fog before 11pm. Low around 13. Northwest wind 5 to 10 mph becoming west after midnight. Chance of precipitation is 80%. Phil, Jay C and Kevin B are heading over the Kaltag portag towards the coast. Based on their speeds part of the trail is ridable other parts are a walk/push for the bikers. After a long rest in Grayling, RD Kyle Durand and his trail companion Adam are tackling the long 120 mile Yukon River stretch towards Kaltag as well as Toni, Troy and Craig. The runners Beat and Peter have left Grayling as well. They are making great time on foot. The Red Lantern runner is Klaus from Austria. He is on his way to Iditarod. Tim Hewitt is a scratch in Anvik. He was running out of time this year for work. Trails are still soft. 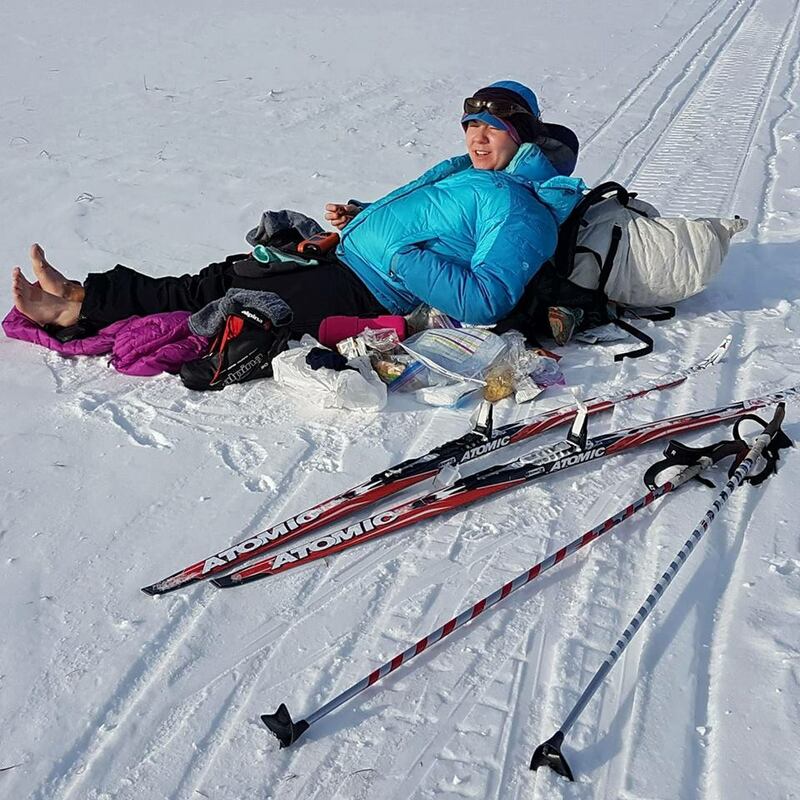 Race leader Jay P has been resting in Unalakleet for over 9 hours. Phil H is still on the Yukon River on his way to Kaltag making slow progress. 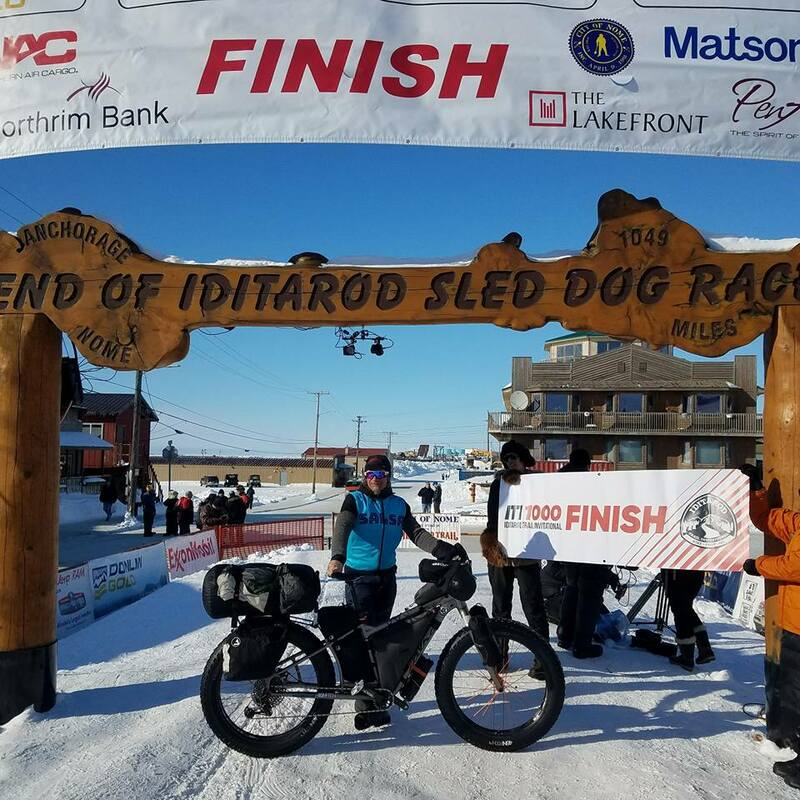 12 racers remain on the trail to Nome on day 13 of the 2018 ITI. Checking the trackers this morning, racers are still making slow progress on the trail. Race leader Jay P has been stopped at the Tripod Flats cabin on the Kaltag portag for 8 hours, it looks like he is moving again. 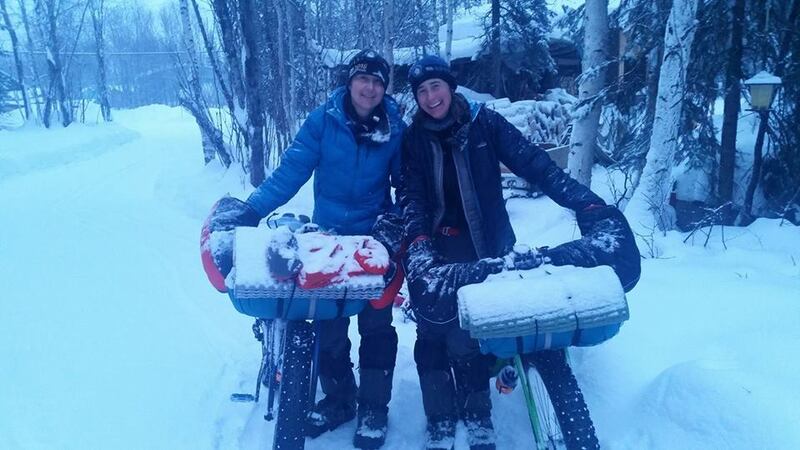 Warm temps, soft trails make for slow travel on the Iditarod Trail at this time. Second biker Phil H is just beyond Eagle Island on the 120 mile Yukon River section. Kevin B and Jay C are in Grayling and RD Kyle D, Adam E are in Anvik this morning. Behind them are runner Tim H, Troy S and several other bikers and runners. The last racer on the trail is Klaus S, he is just out of Ophir. Spoke with Adam E this morning in Anvik. He bivvied last night and got passed by a musher. He is resting and regaining some strength before continuing on up the Yukon River. These were Adam's words: "No easy miles." Slow but steady." 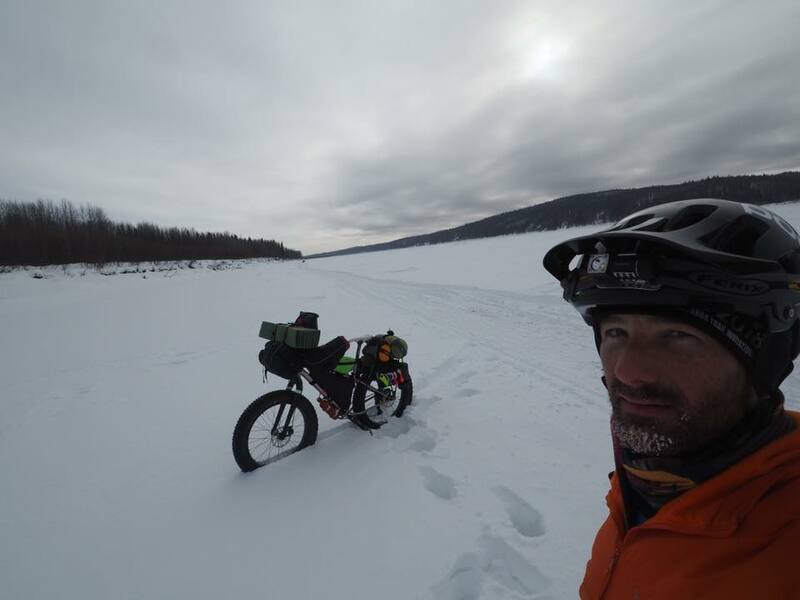 Jay P has put an amazing 91 mile gap on the next rider on the trail, who is Phil Hofstetter from Nome. Racers behind him have stalled out in fresh snow and wind blown, disappearing trails. They are waiting for the Iditarod Trail brakers to pass to break the trail out again. Once the mushers catch them, there will be a lot of traffic on the trail heading to Nome. I spoke with several racers between Shageluk and Grayling by calling the B&B's where they are holding up. Deep snow, drifted in trail is reported by Phil in Grayling and Kevin and Jay C in Shageluk. There is a weather advisory for the Yukon River area for the next 24 hours and a winter weather warning for the Bering Sea Coast. The pattern has been several system that are bringing in more snow and wind to the area. 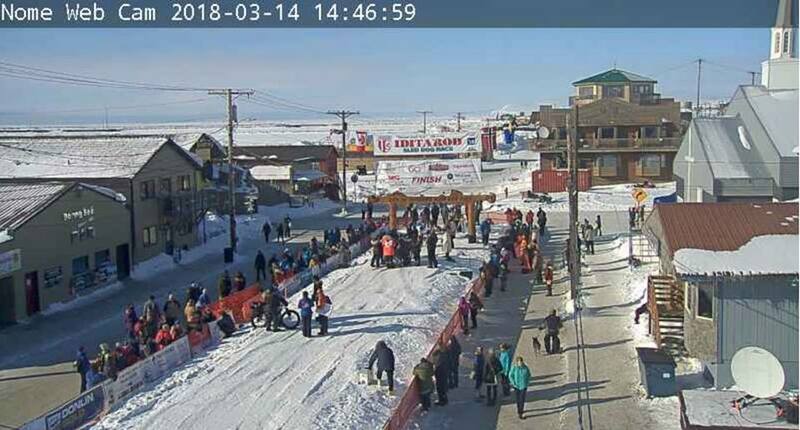 The first musher is out of Ophir and the Iditarod Trail brakers are always ahead of the first musher, within a day the bikers should have a trail. The temperatures have been warm, so trails should pack down well and firm up, especially once it cools off a night. The race leader Jay P is making pretty good progress and is only 36 miles from Kaltag this morning. The word is that he is traveling behind a crew of snowmachiners heading up the trail. Several racers, including me, one of the race directors, have been stranded in McGrath due to the snow fall. It's creating poor visibility so the planes are having issues flying out. I've been told the Pen Air flight is getting out later this afternoon. The race leader in the 1000 mile race, Jay Petervary, is out of Eagle Island (mile 574) this afternoon. The middle of the pack is pushing through soft slow trails towards the Iditarod check point. Temperatures are close to 30 degrees F which makes for soft and slow trail conditions. At the moment Kyle, Troy, and Adam are moving at under 2 mph. Runner Tim Hewitt has passed them up. The runners are making better progress at the moment than the bikers on the section between Ophir and Iditarod. Austrian runner Klaus Schweinberger and Thomas Keene are on route to McGrath this afternoon. The front runners of the Iditarod Sled Dog race will be in McGrath tonight. Race leader Jay Petervary is almost to Grayling. Phil is currently resting in Shageluk. Kyle Durand is reporting waist deep snow with gale force winds just past the Tolstoi cabin. He is traveling with Adam and Troy. With Beat and Craig leaving McGrath this morning, we now have 12 racers on the trail headed to Nome. 6 more racers remain on the trail in the 350 mile event. Carole and Jill are expected to finish this evening. The twins, Jen and Melissa, and Klaus are also on the way. Our Nikolai checker Janny Moser has stayed on longer to wait for Thomas Keene in the checkpoint at the community center. Temperatures have warmed up into the 20's with ice dripping off the roof here in McGrath. It is supposed to get into the 30's later this week in the daytime. The Iditarod sled dog race started yesterday and we expect the first musher to be in McGrath Tuesday night. Warm temperatures make for mushy soft trails in the daytime, but could freeze up if temperatures drop at night time making it easier to ride. Day 7 in McGrath. The weather has been mild for the Interior of Alaska with daytime temperatures in the balmy teens to 20 degrees. David Frearson from New Zealand was the first racer to arrive today day on bike. Grant Maughn finishes in third place in the running division with David and Gavin tying for first place. A total of 12 racers arrived in McGrath today including the highlight of the day, Lindsey Cameron from Fairbanks. 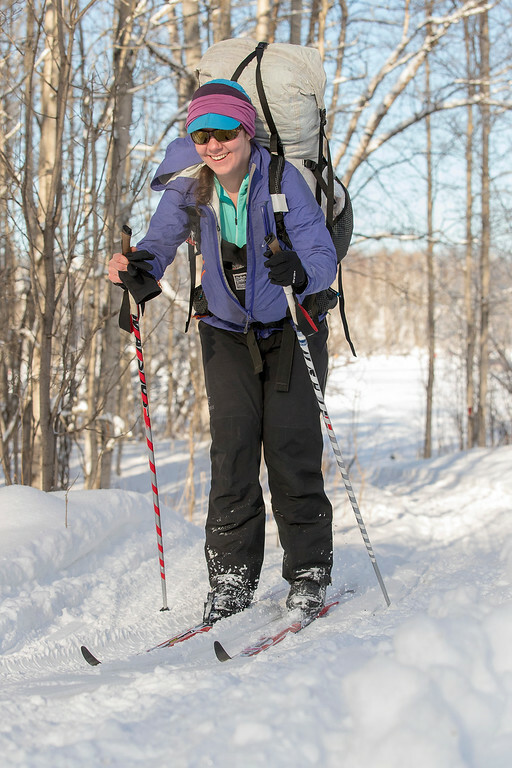 She is the first woman since 2005 to complete the 350 mile trek by ski since Gail Koepf in 2005. Lindsay owns the new women's ski record in 7 days and 52 minutes shaving 5 hours off the previous record. Several more racers departed McGrath this morning heading to Nome including Tim, Troy, Toni, Kyle, Adam. The race leader Jay P is out of Shageluk this evening.